Beanie Bears and Stuffed Animals for gymnastics, cheer, cheerleading, dance. Your gymnast, cheerleader, or dancer will love them! Level Pre Team - 8.5 inch embroidered gymnastics cub club beanie bear. Retired! Get yours before they are gone! 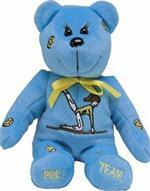 Level 5 - Yellow or Bright Blue 8.5 inch embroidered gymnastics cub club beanie bear. Retired! Get yours before they are gone! 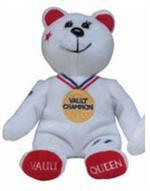 Vault Champ - 8.5 inch embroidered gymnastics cub club beanie bear. Retired! Get yours before they are gone! 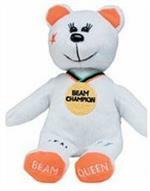 Balance Beam Champ - 8.5 inch embroidered gymnastics cub club beanie bear. Retired! Get yours before they are gone! I Got My Kip - 8.5 inch embroidered gymnastics cub club beanie bear. Retired! Get yours before they are gone! I Got My Giants - 8.5 inch embroidered gymnastics cub club beanie bear. Retired! Get yours before they are gone! 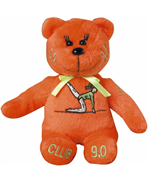 Club 9.0 - 8.5 inch embroidered gymnastics cub club beanie bear. Retired! Get yours before they are gone! 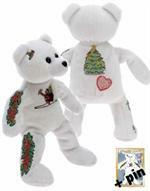 Christmas gymnast gymnastics - 8.5 inch embroidered beanie bear with matching pin. Retired! Get yours before they are gone! 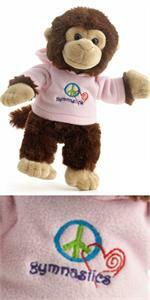 W371-PK Adorable 10" plush monkey with embroidered "Peace, Love, Gymnastics" design on hoodie. Retired! Get yours before they are gone! 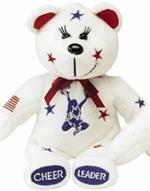 Cheer Cheerleader - 8.5 inch embroidered gymnastics cub club beanie bear. Retired! Get yours before they are gone!